Golf etiquette encourages you to mark your ball on the green. The rules of golf in North America are made and enforced by the United States Golf Association. In addition to the rules themselves, the USGA publishes both decisions and notes that aid golfers and golf officials in applying the rules in different situations. Prior to 1952, ball markers were not allowed. If the ball was in your line on the green and you were stymied, you had to putt around the obstacle or pop your ball over your opponent's ball. The modern rules governing ball markers are found in Rules 16, 20 and 22. This rule states that a ball must be marked before it is lifted. The position of a ball to be lifted should be marked by placing a "ball marker, a small coin or other similar object" immediately behind the ball. However, the language of the rule and the note does not require a certain type of ball marker. You could mark your ball with the tip of a golf umbrella, the shaft of your 5-iron or a tee and it would not violate the rules of the game unless the marker itself caused "mental interference." This rule states that a player may ask his opponent to mark his ball if it "interferes either physically or mentally with his play." Mental interference is not defined, so the marker doesn't have to be in your line or even within your eyesight to be upsetting. But the Decisions book allows the tournament committee to penalize a player who abuses the rule, which "is intended to cover situations where there is a reasonable possibility that one ball might assist or interfere with another ball." A bizarre ball marker, such as the tip of your golf umbrella, could theoretically create a mental image that is so bothersome to an opposing player that he could ask you to switch to another type of marker. 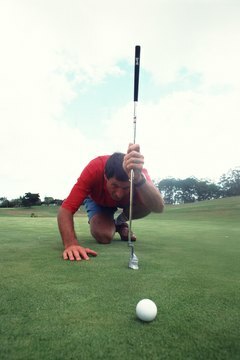 The general rule forbids a player from touching the line of a putt, but it is permissible to press down a ball marker. Although the rules do not recommend it, it is even permissible to place a ball marker in front of your ball. Of course, you need to insure you replace the ball in its correct spot in back of your marker instead of in front, or you will incur a two-stroke penalty in medal play or loss of hole in match play. Sometimes a tournament organizing body supplements USGA rules with local rules that apply to a specific event. The PGA Tour, for example, used to require – not just recommend – that players use "a coin or other small object" as a ball marker. However, at the time of publication, the PGA Tour no longer has such a requirement. In theory, Tiger Woods could use one of his major-championship trophies as a ball marker. The Rules of Golf are designed to support the notion that golf is a "gentleman's game." Players are expected to call penalties on themselves, and often they do so, even if no one else notices the infraction. There are many examples of PGA Tour players calling penalties on themselves and thereby losing prize money and/or being disqualified. The USGA ball marker rules, notes and decisions are designed to encourage players to treat each other with courtesy and respect, as are the other rules of the game. PGA Tour: Will Scotty's Latest Tool Take Ball Markers to Next Level? What Is a Magnetic Ball Marker? What Is the Meaning of a Purple Dot on a Golf Ball?